Sturdy furniture made of… air! Ideal for: terraces, patios, gardens, pool areas. 1 - Every Aery kitchen is externally and internally covered by robust HPL (high pressure laminate), scratch-resistant, anti-shock, water and weatherproof, inalterable along the time. A patented manufacturing process allows the application of the laminate panel on an extra-light polypropylene honeycomb structure, purposely studied by Aeroform. Our panels are then edge-banded with a special exclusive sealing system by Aeroform. AERY contains no wood: the panels are therefore extremely light, non-deformable and virtually indestructible. They are non-toxic and can easily disposed. 2 - The upper cover may be closed, perfectly sealing the cooking hobs, preventing any water infiltration due to weather conditions to cause any damage to the appliances. 3 - The worktop is raised to prevent the rain to penetrate and wet the hob. 4 - Kitchens can be equipped with single or domino-cooking hobs (in the 90 and 120 cm wide versions) of any brand: gas, vitro-ceramic, induction, lava stone grill, teppanyaki etc. 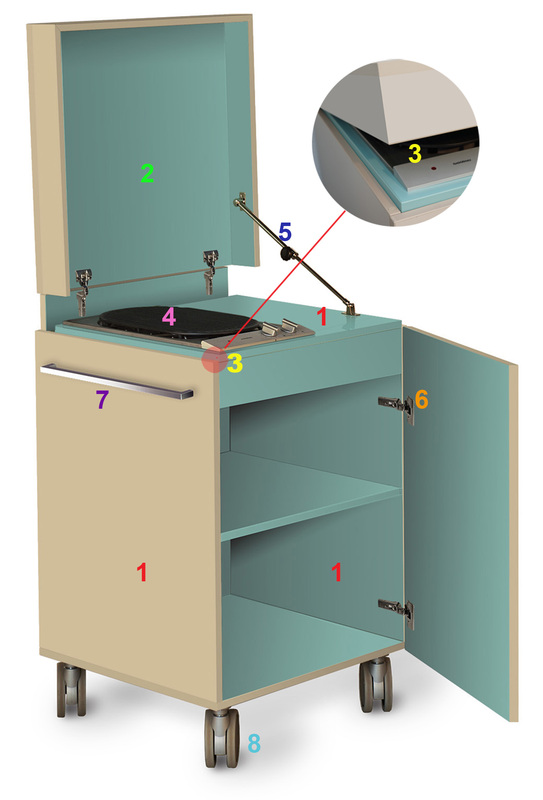 All 90 and 120 cm wide versions may be equipped by a sink with folding tap. 5 - The strong “windstopper” arm prevents accidental closing of the top due to wind gusts. 6 - The strong soft-closing hinges are plugged into the AERFORM panels with special patented dowels. 7 - The steel handles help repositioning this extra-light kitchen. They may be used to store cut-boards and hang ladles and other cooking tools. Furthermore, they may serve as connecting elements to quickly assemble the special intermediate hanging cabinet between two kitchens. A complete and fully equipped kitchen may be obtained. 8 - The large plastic castors, with braking system, are perfect for moving the kitchen on the rambling ground of gardens. Steel legs are also available in case In case of fixed positioning of the kitchen.